Fettuccine Alfredo, I love you. I do. But we’ve been together for so long now, and while I feel that I have developed new interests and generally grown and expanded my horizons, you have stayed the same as you’ve ever been…a creamy and decadent bowl of pasta with cream and butter and parmesan cheese. And frankly, I’m getting a little, well, bored. So if we are going to continue our relationship, you’re going to have to evolve along with me. I’m thinking blue cheese. I’m thinking artichokes. 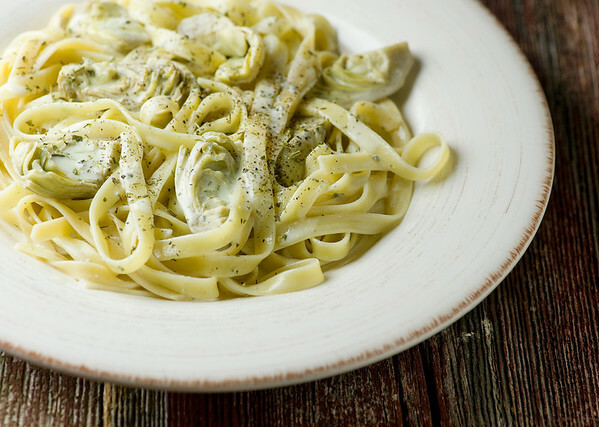 I’m thinking that we can keep that part of our love affair that has been the foundation of our love for so many years…the silky, decadent cream, the ribbons of pasta cooked to al dente perfection, the hint of parmesan cheese. But let’s liven things up by adding some crumbled blue cheese to sauce and stirring it around until it is melted and perfect…I’m thinking a nice hunk of Cashel Blue. And let’s throw caution to the wind by tossing a whole lot of artichoke hearts into the middle of everything, and topping the whole thing off with a crazy, spicy amount of fresh ground pepper. I understand that a deep love of blue cheese is essential to making this work, but I’m ready for that. And don’t worry, I’m still going to warm the plates, because I know that warm plates are one of the major reasons we have lasted so long. In the end, a relationship as long and devoted as ours has been is strong enough to weather any amount of change and come out even more delicious on the other side. So Fettuccine Alfredo, call me maybe? 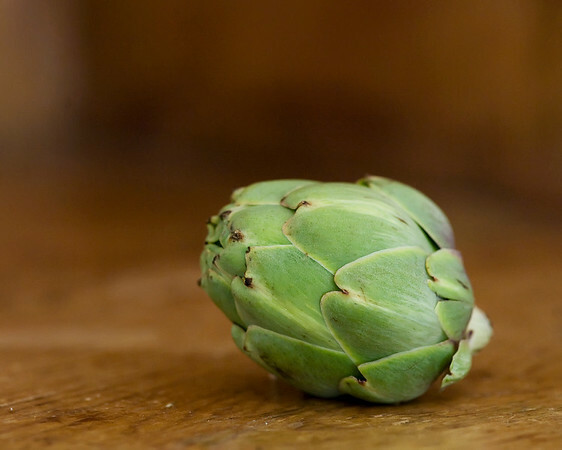 And this time, bring along the blue cheese and the artichokes! While pasta is cooking, combine cheeses and cream in a medium sized deep sides skillet over medium heat and stir until cheeses are melted. Add artichoke hearts and oregano and heat through. Add pasta to skillet and toss with tongs until well coated. 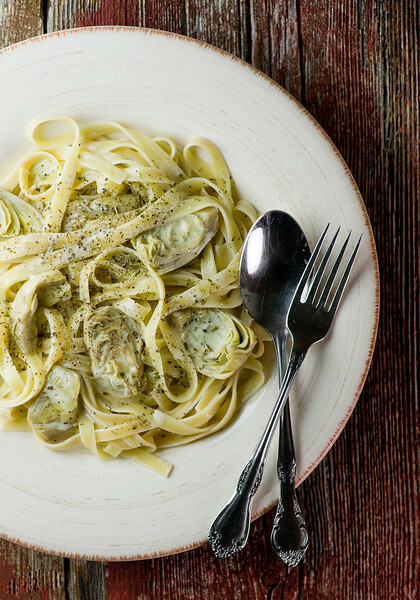 Divide pasta among warmed plates, grind a generous amount of black pepper on top and serve. I agree, fettuccine alfredo definitely needs to adapt itself to this modern world in which we live! Perfect modifications, if ever I’ve seen any! Aaaah…love your wedding photo…so cute! OMG! This sounds so good! If only I weren’t allergic to veined cheese. I know I can think of something to sub, because I really, really want to make this for dinner. Any easily melting cheese will do just fine…one day I am going to try this with brie!